Hey, Just wondering if there would be room for a feature request? This mod is great and i love it a lot as is. However, i would love to be able to configure another color, say blue, for a range i need to put a torch while mining. When i mine, i put a torch above me at block light level 3. This provides me with a perfect ~...9889...~ pattern in my mines. Currently I have to count the 4 blocks from 7-3. This is an improvement from enabling F3 debug which i am glad to get away from, but it would be perfect if i could specify another color and range to light up specifically for torch placement. I would also like to keep the red indication from 7-0, I would just like light level 3 to light up blue. I know how to adjust the settings to light up 3-0 as red. Thank you for this mod and all the work to develop and update. Is it possible to have an equivalent with a data pack ? On 1.12.2 light overlay don't work, but chunk overlay do. Is anyone have same problem or it's just me? Maybe the Keybinding is somehow blocked. I can't reproduce the problem nor find any issue in the code. Maybe it works after changing the keybinding from F7 to some other key. EDIT: Please also check if you are running the newest version. I used to play with a modpack that apparently had this mod, and I used it to figure out where to put torches. I thought it was a part of the default game! so there I was, pressing F7, wondering why the overlay wasn't showing up. now I know. Me and my friends are playing a slimefun server and I tried to get this plugin in order to look for certain items with custom names? Sadly, this does not work. Is there an option I am missing in order to find this and/or can you plan to add this feature in the future, it would be much appreciated! Hey me and a few buddies use this on an SMP server and are loving yur mod! But one problem is that one of our members has an enchantment shop where they sell enchantment books. and sadly you cannot search for specific books with specific enchantments like you can in the JEI interface. Is there any plans on adding the ability to search for books with specific enchants within chests? It would be much appreciated if this feature were to be added! Is it possible to turn of the "dim" feature? I really don't like the whole work go darkish when you have these boundaries active. I don't know exactly what you mean. I think you refer to a bug (https://github.com/feldim2425/MoreOverlays/issues/17). 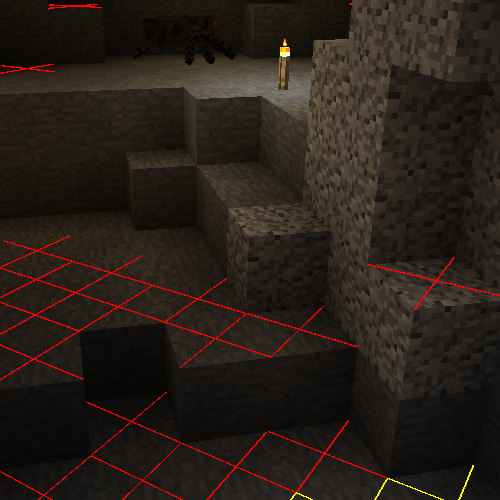 There is no feature that turns the world dark when you enable the chunk boundaries. But I have no idea whats causing that. Currently there is no way to see slime chunks. But I will try to add it. Mods like botania add things that help with that, such as Slime in a Jar, which bounces when you're in a slime chunk. That, or use amidst. I think the biggest problem it, that you can only find slime chunks if you have access to the world seed. Singleplayer will work without problems but there is a permissions Problem on Servers. Other Mods might get around that because they are Client and Server side and can send data from the Server. More Overlays doesn't have this option.